When a traditional fishing pole just won’t suffice, grab a fish trap to catch an even greater amount of fish and crawfish! 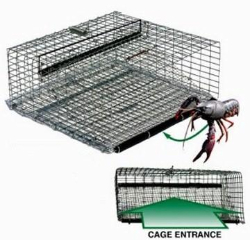 One advantage of using fish and crawfish traps is that the fish remain alive inside the trap, leaving them relatively unharmed. Additionally, as a means of respecting area fishing regulations, the trap also allows you to release undersized fish.